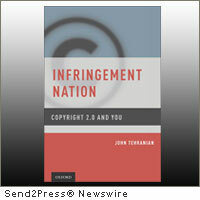 LOS ANGELES, Calif., May 11, 2011 (SEND2PRESS NEWSWIRE) — To coincide with the 300th anniversary of copyright law, Oxford University Press announces the much-anticipated release of John Tehranian’s new book, “Infringement Nation: Copyright 2.0 and You” (ISBN: 978-0-19-973-317-0). “Infringement Nation” presents a rollicking and accessible analysis of the history and evolution of copyright law and its profound impact on the lives of ordinary individuals in the twenty-first century by asking a simple, but surprising, question: could you be committing $4.5 billion in copyright infringements each year? Organized around the theme of the individual in five different copyright-related contexts – an infringer, transformer, pure user, creator and reformer – “Infringement Nation” charts the changing contours of copyright regime and assesses its vitality in the digital age. In the process, Professor Tehranian challenges some of the most basic assumptions about copyright law by highlighting the unseemly amount of infringement liability an average person rings up daily; the counterintuitive role of the fair use doctrine in radically expanding the copyright monopoly; and the under appreciated expressive interests at play in the consumption of copyrighted works. He also discusses the surprisingly low level of protection that American copyright law grants many creators; and the growing role of copyright law in the exertion of social regulation. Drawing upon theory and personal experiences litigating high-profile infringement suits involving the works of such luminaries as Jimi Hendrix, Winston Churchill, Don Henley and others, Professor Tehranian supports his arguments with a rich array of diverse examples. In the process, he touches on the unusual origins of Nirvana’s “Smells Like Teen Spirit” and the question of numeracy among Amazonian hunter-gatherers, while documenting the history of stand-offs at papal nunciatures and contemplating Ashley Wilkes’s orientation, Captain Kirk’s reincarnation, and Holden Caulfield’s maturation. “Infringement Nation” (ISBN-13: 978-0199733170, Hardcover) is 320 pages and available on Amazon.com: http://amzn.com/0199733171 . More information, including a blog on the latest developments in entertainment and intellectual property law, are available at: http://www.infringementnation.com . John Tehranian is an academic, attorney and author. He has served as a tenured Professor of Law at the University of Utah, S.J. Quinney College of Law. In the fall of 2011, he will join Southwestern Law School and the Biederman Entertainment and Media Law Institute as the Irwin R. Buchalter Professor of Law. A graduate of Harvard University and Yale Law School, he is a founding partner of One LLP – an entertainment and intellectual property firm in Southern California known for handling high-profile copyright litigation. He is also the author of “Whitewashed” (New York University Press, 2009). Original Keywords: non-fiction, Infringement Nation Copyright 2.0 and You, ISBN 9780199733170, Oxford University Press, John Tehranian, copyright law, book, publishing, author, hardcover, publication, IP laws, intellectual property, ownership, rights, fair use, One LLP founder Oxford University Press Los Angeles California LOS ANGELES, Calif.
REFERENCES: Books and Publishing News, non-fiction, Infringement Nation Copyright 2.0 and You, ISBN 9780199733170, Oxford University Press, John Tehranian, copyright law, book, publishing, author, hardcover, publication, IP laws, intellectual property, ownership, rights, fair use, One LLP founder Oxford University Press Los Angeles California LOS ANGELES, Calif.